Along the road a little miracle occurred in the shape of a transit van that stopped alongside whilst the driver asked if I wanted a lift. I thought for a full nano-second before accepting this very kind offer. It felt like cheating and a total betrayal of the plan, but the state I was in meant that I had few other options. The bike plus one of the occupants went in the back of the van and I sat in front with the other two. They were joiners returning to Stornoway from their house building job. The cab was warm and I soon realised I'd made the right choice. This was confirmed as the van's engine strained to propel the vehicle up and over An Cliseam. There was no way on Earth that at my level of fitness I could have tackled that fierce-some ascent in such atrocious conditions. Spectacular views with major climb after climb, equally spectacular and daunting on the way down the other side. We passed a cyclist on the first descent, I think it was the man in orange. I have nothing but admiration for this guy, to cycle up there straight after climbing the summit between Leverburgh and Tarbert! The joiners suggested places to stay in Stornoway, however I told them that I'd planned to go to Calanais so they offered to drop me at the turning. I thanked them for being so helpful, they said that everyone in Stornoway wanted to be helpful. I watched the van's tail lights disappear whilst the cold wind and rain felt shocking after the warmth and relative comfort of the van. Once more into the howling wet gale I knew I had to find shelter soon. The man in orange had told me of his preference for camping in tree plantations for shelter, so that seemed like a good idea. Eventually I found a small copse off to the right just after Acha Mor (NB298298). Whilst being far from ideal, I was near the end of my endurance. The tent was pitched in the rain as I looked forward to dry clothes, hot food and drink. I knew I would soon start to feel better. I cheered myself up with sweet hot chocolate, pasta with bolognese sauce and milk chocolate. The camp site was not up to previous standards but at least it had stopped raining. 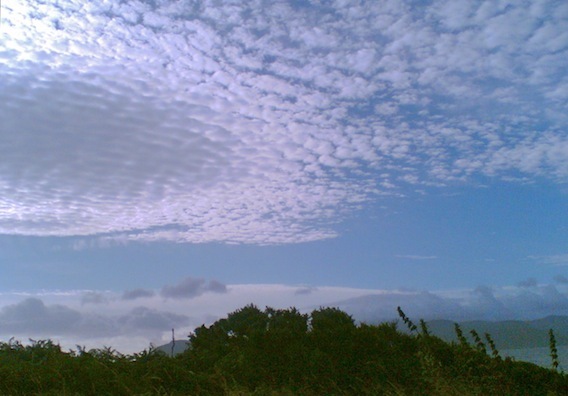 As the clouds formed cotton wool patterns in the sky I counted myself extremely fortunate. This unexpected change of events had one positive effect, a lot of time had been saved. I had seen the Cliseam which I couldn't have cycled over in a month of Sundays and now thoughts turned to the plan for the rest of my journey. The joiners had considered my options, their preferred route being Stornoway to Ullapool by ferry and train or bike to Inverness, then by train or bus to Oban either via Glasgow or direct. My preference was to take the bus from Stornoway back to Tarbert, the woman in the tourist information had told me that the bus carried bikes. I could catch the ferry to Uig on Skye and then the ferry back to Lochmaddy on North Uist. This would allow me to cycle to Lochboisdale to catch the ferry for Oban. My love of boats was the main reason for this plan facilitated by the now very soggy Calmac eight day rover ticket.